I figured I would get their attention with the thought that they could gain a customer. Guess not. I prefer to roll my own too. Even if it costs me just as much as Wolf, I know the quality of my hand loads is better. Other than Wolf in my AK (I recently started loading for that too) and .22LR, I can't remember the last time I shot factory ammo. 7.62NATO - because shooting something twice with 5.56NATO is just plain silly. Here is a copy of my e-mail and response to Wolf. To their credit, they responded in less than 24 hrs. As far as we know the 308 is safe to shoot in your weapon, there are no particular lot #s that we have recalled. Any unsatisfactory performance in any of our ammunition we will gladly remedy. I have been shooting Wolf ammo for several years, notably in 7.62 x 39, .223, .45 ACP and .308. Generally, I have been very pleased. I have been hesitant to continue shooting the .308 based on reports of case head failures. Have the issues with the .308 ammo been resolved, and are there any lot #’s that have been identified as unsafe? I have about 1,200 rounds of .308 from various lots and would like to be assured that it is safe before I shoot it in $1,000 + rifles or sell it to my customers. Please advise at your earliest convenience. I had one round blow up and basically blow my clip apart. The top of the casing ripped off and I now have a casing lodged in my my gun. I tried the shell extractor but that doesn't work. 1. How do I get the shell out? 2. How can I get rid of this ammo? TRy a s.s .45cal bore brush on a stiff rod. Shove it into the chamber and give it a yank backwards. The bristles should be wedged in at an angle, and when pulling back out in the same direction will stay in [relative] alignment as you withdraw. This should catch the remains of the cas e and pull it free. Next option is to use a scribe and get under one edge of the broken case and lift it enough to grab wi]th a forceps or small needle-nose pliers. Put some penatrating oil in the chamber. Get a 7.62 Nato ruptured case extractor G.I. issue for a M-60. Use a solid cleaning rod to tap out the case from the muzzle. Pull down, the ammo save the bullet and powder, use a U.S. manufactured brass case. If you cannot safely take them appart with a collet bullet puller, throw the ammo in the closest river. I tried the 45 bore brush with no luck. Tried the 308 shell extractor with no luck. I tried the solid clean rod but the one I have isn't coming in contact with the shell. Put the shell extractor in place. Use the cleaning rod to tap against the shell extractor. I don't think it's possible to double or even overcharge 7.62x51 to the point where an overcharge is the problem. With Varget at the recommended load my cases are full, only ~2mm or so of air remaining. That small an overcharge doesn't sound like it would cause a KB. This kind of discussion is the number two reason why I started reloading. I know exactly what I loaded, and I know exactly who to talk to if there is a problem. Federal Gold primers and Varget are pretty well qualified components. The rest is my QC. Number one hasn't materialized yet, stoopid high taxes on ammo. In 94 and 2000 it looked like it was possible. I used to work in a store that sold scads of Wolf. He (owner) had a deal direct from the Wolf importer so he could sell it cheap. I tried it and had too many problems. I have had to knock many a squib round out of my barrel with their 9x18 and 9x19mm. In .308 I had a head seperation that desroyed my magazine and damaged my FAL . Wolf did pay for all repairs, I'll give them that much credit. I hated selling the stuff because I detested it after all the trouble it caused me. The ony good use I can think for Wolf ammo is in a training situation. It would be great for training on malfunction clearance drills. If I can't find surplus I just crank up the press and roll my own. I don't think it's possible to...overcharge 7.62x51 to the point where an overcharge is the problem. Anytime you are shooting loads that expand the primer pocket, you are real close to a big dose of trouble. Guys, don't buy russian ammo, regardless it's a brass or steel case. The russians have no idea what quality control and quality production means. They have some quality controlled processes only in the military manufacturing. You may have shot 10,000 rounds, but there will be the 10,001st to ruin your gun. Ill complete the circle of this Bolt Action Only Ammo. Why wouldn't you hunt with an FAL? "I love my Beater AK"
I fired 20 rounds of Wolf steel cased 308 yesterday and had two primers back out a bit and one casing had a smudge of black around it's primer, presumably from gas leakage. I checked headspace and I'm not even close to closing on a .308 field. I will stay away from wolf now in this caliber but it's all my range had for sale at a reasonable price last time I was there. I have fired 5,000 - 7,000 rounds of Wolf in 5.56, 5.45 and 7.62x39. I have had zero problems with it save for big time failures in the AR-15 due to it being DIRTY and the 7.62 x 39 hollow point. I had 1,000 rounds of the hollow point. Ran it through 3 factory built AKM's and all three had failures to feed. As far as I can remember these are the only failures I have ever had in more than 20 years of shooting AKs. My experience suggests to me that the three rifle calibers mentioned are okay as long as you keep it out of AR-15s and you stick to FMJ. I have no interest in their pistol ammo, too many other choices out there. Same goes for the 7.62 NATO. I've shot a lot of russian stuff in 7.62x39 and 5.45x39 with no problems. That said, I've shot a couple of thousand rounds of it (wolf, and two other russian brands) in .223 and in that caliber I've had several problems. Primers popping and coming out, split necks, etc. - I don't know what it is, but it seems like the russian stuff just doesn't work well in US calibers. I know I don't plan on buying any more except in soviet calibers. I've shot a lot of it in 7.62x39 and some in .223 but I wouldn't shoot it in "western" calibers. I have just seen too many stuck cases and misery over it. The general rule is brass cased "proven" factory ammo or handloads for "American" calibers. I definitely won't be shooting any steel cased russian stuff after reading this. Smart guy here !! ... when you're priming and it seems too easy you have a problem ... consider yourself lucky that you made it back home just to prime your cases !! While at the range yesterday I had a Wolf 308 case head separate. 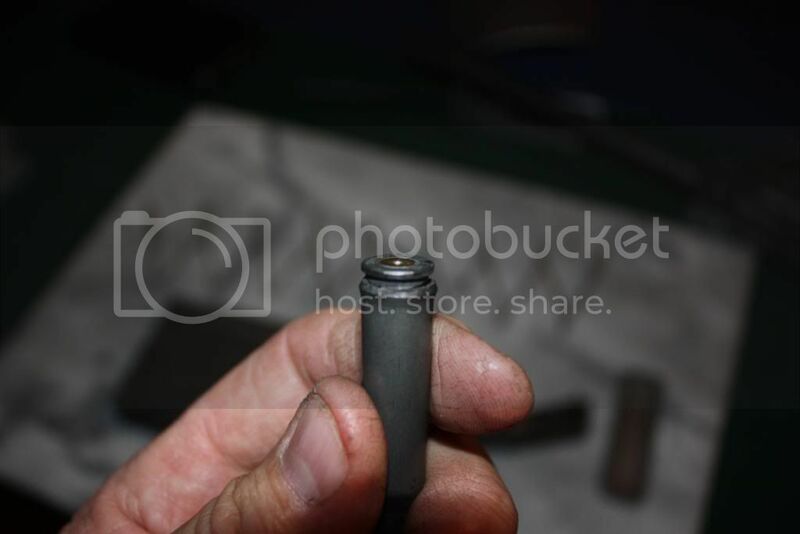 It blew the follower,spring and floor plate out along with the rest of the rounds in the mag. The mag bottom was expanded out half an inch like a baloon. I had previously fired 100 rounds of SA and US ball without a hitch. Got a good hot spray of powder on my face and safety glasses. No other damage to the FAL. The fired cases were fine at the base so I don't think it was headspace. I include a picture which looks like the case head failed. Any one else have problems with Wolf ? Thanks Bruce Sorry can't post a pic. Not allowed attachments for some reason. I cannot understand why do you guys use .308 ammo instead of 7,62x51. You know very well it is not safe to shoot .308 in mil rifles. Also the right ammo for the FAL shall have the NATO stamp on the head. Steel cases are much more prone to break, because steel doesn't have enough ductility. FWIW, the shooter in the case I just cited was shooting a DSA FAL. DSA marks their guns ".308"
Well, today I recieved a small check from the Wolf Performance ammo folks. I had sent the ammo and damaged cases in to them about 3 weeks ago. They covered my damaged mag and a box of ammo. I hope the unfired rounds I sent them will be of value in evaluating the problem with the ammunition that was defective. I will continue to shoot their ammo in other caliber since I never had problems in 5.56, 9mm, 45. My hats off to them for acknowleding my contact. I have had other companies ignore my letters. That did not make me happy with their attitude. Any updates on the Wolf ammo? I just bought some that I was going to shoot in my FAL until I saw this. Is newer production stuff safe? Is there a way to tell when this was manufactured? I shoot steel cased 9mm/45acp/223 but have not tried wolf branded 308 but have shot a good bit of Ulanosk 308 which is likely similar and it is ok blasting ammo not high q/c ammo. They all tend to make quite a bit of carbon fouling. Wolf Primers are suspect too! For about a year after BO got elected, it was hard to find Made in the USA loading components. I, unfortunately, bought a bunch of Wolf primers and immediately noticed an above average failure/misfire rate. I also noticed that a few of the primers would actually come apart (loose anvil) when being shaked in the hand primer to get them face-up. I have also noticed during my Range Brass Scrounging that people are throwing out lots of live Wolf/Steel ammo that have misfired. One day I actually found 30 223s and only a few had firing pin "dents" in the primer. Somebody had a bad day!? They shot OK in my rifle but a few were too underpowered to cycle the action. Last week I found 5 308s with off center but normal primer dents and these fired OK too but I think my days of "experimenting with this Crap is over!!! I have not had any serious failures with Wolf but I have had two incidents that have convinced me that Wolf goes in nothing but my SKS's. We have 2 M1 Carbines that we have been shooting surplus, LC repacks. and hand loads in for the better part of 8 years and the only broken extractor I have had in either gun was 8 rounds into a 15 round mag loaded with Wolf. The other was this past spring while we were camping and shooting down at the hunting club off season and a friend taught Bob to bump fire his CAR-15. He tried three mags loaded with Wolf 62gn and never did get more than about 5 rounds downrange without some sort of FTF, FTE, stovepipe and so on. After that I gave him 2 30 round mags loaded with Radway Green SS109 and proceeded to empty both mags in seconds without any issues. i have never had a problem with wolf primers. although, i only use them for range/fun/blasting ammo. I heard this before. It seems that the quality control is not there when it pertains to Nato Ammo. There have been more problems with Wolf Ammo in 5.56mm and 7.62x51. Now it seems their 7.62x39 and 7.62x54 are all right. Hi guys, it's good to be back. I've been reading this thread with great interest. Since the Wolf is suspect to a lot of people on here and probably in the real world, what ammo IS working well if you're not rolling your own? Also, since it's been so long since this thread was started and the current political climate is making some people scared, has anyone information they'd like to share as far as stores / locations with good supplies and of course prices? I reload but I also shoot Wolf a lot. Never had a problem with any Wolf Ammo, 7.62x39, .223, .308, .45, and .40 have all worked great for me. I had one batch of wolf about 5 years ago that got about 1 out 30 LPS with light triggers, but other than that, Wolf has been great. Even shoot Wolf through my Slide Fire AR without issues, about 4k rounds with the slide fire alone. Only thing I would not shoot Wolf in are Stainless barrels, Wolf is bimetal (and not copper), so it will wear your barrels faster, with SS going the fastest. I think Wolf through Chrome Lined barrel is fine though. I have been shooting wolf 308 since 2005 without an issue. I probably have around 3k of wolf from older to new stock and I am not afraid to use it in my ptr, saiga and fal. I will,as always, inspect my ammo and wear my glasses. I've never had an issue with even the cheapest Commie ammo in Russian rifles. But I'll ever put Russian ammo near my C1, or my of my other Western rifles. My new imbel inch fal has been running everything I've put through it without one failure. Until I decided to use up 2 boxes of wolf 308 steel case I had been saving to use instead of my better fodder. First round out felt really strong. The second did not eject, the primer was gone, and the rim was separated half way around. I used my case extractor and with some effort removed the case. I checked out the first case and could see a visible crack on the rim shoulder. I stuck in a mag of Winchester 147 gr and it ran smooth as silk. After reading this post and what happened to me, I trashed the remaining rds. II wouldn't even give them away---their far too dangerous. I will reload my junk to put in a real battle rifle. I keep hearing nothing available Bs. i have seen a bullet get push backwards making a compressed load ...if you pull that trigger ...kabang ! i had an ak-74 blow off dust cover and bent trunnion with S&B ammo once ....yes s&b sent me a new rifle and case of ammo too ...things can and will happen ,its man made !! A compressed charge does not necessarily mean a KB, although I suppose it might happen. My regular .223 load is a (heavily) compressed charge of RL15 with a 75 seated to mag length. It is absolutely trouble-free and shows not the first sign of pressure problems. I have probably shot 3,000 of them over the last five years. I've shot rounds that were pushed back due to a crappy mag feed in the military out of Colt m16A2s no less. No problems. Now they probably don't seat in the lands, but they don't blow you up. I'm none too pleased with any of the steel-cased 308. I'll never shoot any of it again. The only firearm that'll ever see any steel-cased ammo will by my AK. I was not a member at the time but now this thread explains a whole lot. Back in 2008 at a local Nebraska gun show a friend of mine was selling 500 rounds of WOLF 308 at a ridiculously low price. I bought 300 of it, and then went back and got the other 200 rounds he had. Now I know why he was selling it so cheap, and now I understand he was NO FRIEND. I have an FR-8 and a Spanish Mauser that should shoot this stuff just fine....I hope. With .308 around 50-55 cents a round, you don't save that much really especially if you reload. I had Wolf 308 start having head separation issues. Shot lots of it no problems. Bought 2 500 round boxes and started having trouble, not just 1 or 2, lots. Weighed the rounds, any round 350 grains or higher were held out. No problems after that. lost about 125 rounds. I'M FROM THE GOVERNMENT....I'M HERE TO HELP!! This is my own thinking of STEAL CASE AMMO. The only thing I can come up with is; is the shape of the casing. We as in the West (USA, Western Europe and most Nato Countries) us a semi strait case and the East (Russia, China) uses a tapered case. Plus they use a polymer coating to keep the steal cases from rusting. This polymer coating is the problem as I see it. when at the range are out just plinking. As the weapon heats up what happens to the polymer? As for as I can see it starts to melt, building up a coating in the chamber, causing rounds not to seat properly. CABOOM. 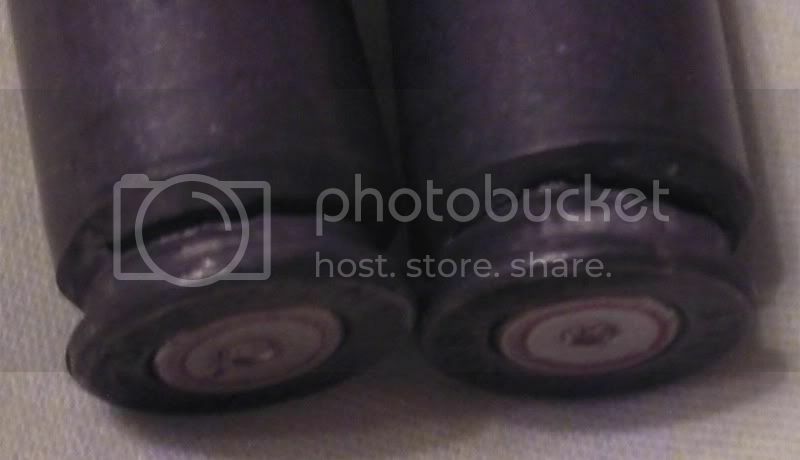 The only way I would use steal case ammo is somehow to remove the polymer coating first. Pull the bullet on any polymer coated steel case, empty the powder and fire the primer. Then, take a propane torch to it and see if you can melt the polymer off.